Even when you’re on vacation or celebrating a special occasion, it’s easy to fall back on your same-old go-to drink orders and your same-old places to go drink. While there’s nothing wrong with having old favorites, it’s also exciting to explore new-to-you watering holes in search of future favorites to add to your stand-by list. One of the frequently-ordered libations at this legendary dive bar is the Bloody Mary, the popularity of which the bar’s owner attributes to each bartender making it “a little different every time.” Plan to sip and stay a spell, especially on a Sunday, while you visit with some of Marie&apos;s colorful crowd of regulars. Blue Mesa’s signature drink, made with agave tequila and Blue Curaçao, is as gorgeous to look at as it yummy to drink. Stop in and sample frozen or on the rocks during Blue Mesa’s famous happy hour, which includes a complimentary quesadilla bar during the week and half-price appetizers on the weekend. This cozy Downtown Arlington pub has been beloved for generations for its juicy burgers, fish-and-chips and an all-day happy hour on Monday—as well as the Bentley’s Bender, a winning combination of Jameson whiskey, triple sec, orange juice and lemonade, served over ice. You’re probably going to be very glad you tried the Caipirinha, Brazil’s version of the mojito/margarita. It’s a refreshingly tropical concoction of juicy lime, sugar, and a rum-like liquor called Cachaça, shaken vigorously and served over ice. Enjoy during happy hour or dinner, then try a Brazilian Coffee Cocktail, an after-dinner treat that features espresso and a combination of multi-flavored liqueurs. Whether you’re stopping in for some late night, post-game libations or a lingering Friday lunch, Sherlock’s Cherry Pop—a blend of Three Olives Cherry Vodka, sweet and sour, cranberry juice, and simple syrup, topped off with club soda—is sure to hit the spot. Among the rock stars of the ginormous Humperdinks menu is the oh-so-satisfying Humperdinks Voodoo, which features a blend of fruit-flavored rums and fruit juices topped off with a float of Myer’s Dark Rum. Or, if you&apos;re in a dessert drink mood, try the B-52 Strike, featuring Kahlua, Baileys Irish Cream, Grand Marnier and chocolate ice cream. It’s seriously yummy. Fresh ingredients make the difference in Hooligan’s preparation of a classic Old Fashioned, which features a sugar cube and bitters combined with whiskey or brandy, orange slice and a cherry. Enjoy while you explore Hooligan’s digital jukebox or munch on food deliveries from nearby Downtown Arlington eateries, such as J. Gilligan’s or Flying Fish. This Tex-Mex-inspired martini stars Maestro Dobel Tequila, fresh lime juice and a touch of Grand Marnier, served straight up in a frozen glass. Enjoy during Rio Mambo’s robust happy hour, which includes complimentary queso, quesadillas and nachos. This popular sports bar is known for spacious patios and an all-day happy hour, where you can enjoy one or more of BoomerJack’s Mason Jar cocktails, such as the Lone Star Lemonade (featuring Tito’s Vodka), the Tropical Hurricane (featuring Southern Comfort), or the Ultimate Iced Tea (a little bit of everything and a splash of Coke). Amongst the lineup of signature martinis at this popular surf-and-turf eatery is the delicious Parrothead Martini, made with Patron tequila, Cointreau triple sec, fresh lime juice, and sugar. For the next round, try the Parrothead’s spinoff— the Pepperhead Martini, which adds a kick in the form of serrano pepper-infused simple syrup. It’s almost too pretty to drink, but eventually you won’t be able to resist finishing off the Swamp Thing, a tropical blend of raspberry and melon liqueurs layered with frozen margarita and frozen Hurricane, garnished with a fresh pineapple slice. Try it with a Pappadeaux starter, like the shrimp and crawfish fondue or the jumbo lump crab cakes. Whether you&apos;re ordering from the kitchen or the bar, RBar&apos;s creative, Texas-themed menu never fails to deliver. 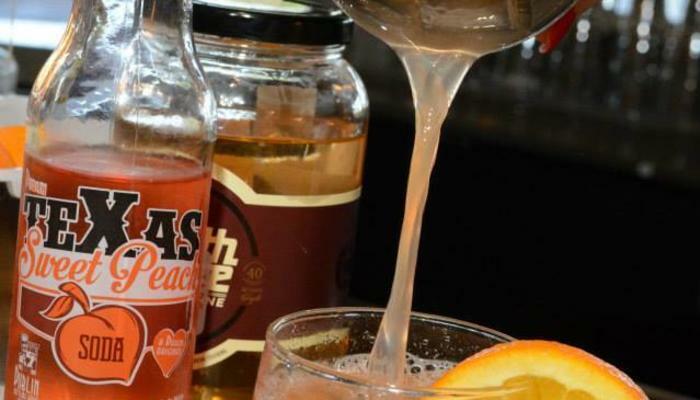 Next time you&apos;re in town, try the Texas Peach, where expert mixologists take Deep Eddy Peach vodka, mix it with some Dublin peach soda (real cane sugar), some O.J. and a splash of soda water for a real treat for your taste buds. Excuse us as we walk, no RUN, to happy hour. Talk about refreshing: White rum, lemon and lime juice, crushed watermelon, sugar and soda, served up in The Keg’s classic steakhouse setting. If you’re indulging during happy hour, try pairing your Watermelon Mojito with the baked brie or loaded nachos from the bar menu. It’s hard to pick just one signature favorite from Piranha’s creative martini menu. But if we had to, we’d probably go with the charming Wedding Cake Martini, featuring Three Olives vanilla vodka, Frangelico, pineapple and a splash of cranberry juice. Be aware: It’s so yummy you might have trouble stopping at one.